Part Used & Method for Pharmaceutical Preparations: The fleshy stems are gathered in spring, dried in the sun and cut into slices. Properties & Taste: Sweet, salty and warm. Meridians: Kidney and large intestine. 1. Deficiency of the kidneys manifested as impotence. Cistanche (Roucongrong) is used with Prepared rehmannia root (Shudihuang), Dadder seed (Tusizi) and Schisandra fruit (Wuweizi) in the formula Roucongrong Wan. 2. Frigidity and infertility. 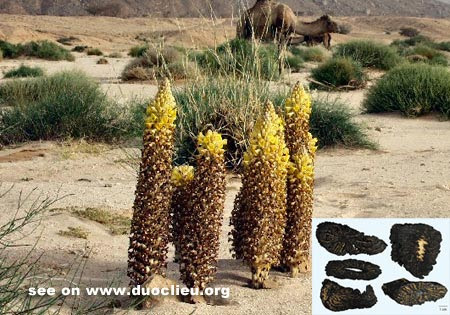 Cistanche (Roucongrong) is used with Antler glue (Lujiaojiao), Human placenta (Ziheche) and Prepared rehmannia root (Shudihuang). 3. Pain in the lower back and knees and fragile bones and tendons due to kidney deficiency. Cistanche (Roucongrong) is used with Morinda root (Bajitian) and Eucommia bark (Duzhong) in the formula Jingang Wan. 4. Constipation due to dryness in the intestines. Cistanche (Roucongrong) is used with Hemp seed (Huomaren) in the formula Runchang Wan. Cautions & Contraindications: This herb is contraindicated in cases with deficiency of yin with excessive fire, diarrhea or constipation due to excessive heat in the stomach and intestine.